Contributed : Aug. 9, 2018, 10:24 p.m.
Aug. 9, 2018 -- On Thursday, Aug. 9, at 9:23 a.m., the Dunlap Fire Department received a mutual aid assignment for a structure fire, just inside Bledsoe County on McWilliams Road. Dunlap 3 Engine, 1 Tanker, and Chief 1 responded to the scene to find a two-story attached garage on fire. 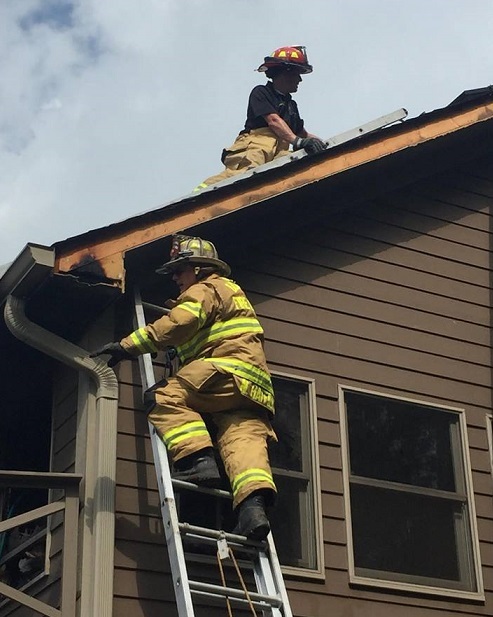 Due to the construction of the residence, and the quick action of the homeowner to get water onto the fire, it was contained to the garage, and did not damage the living area of the home. Firefighters were able to finish extinguishing the fire, which is believed to have been ignited by an electric fan in the garage/workshop area. No injuries were reported as crews returned to service. Photo courtesy of Dunlap Fire Department.